Are you looking for a Logbook Loan in London? If you are looking for a Logbook Loan, then look no further. Car Cash Point will never be beaten on price, quality or service by any London Logbook Loan Lender. With our 'Best Rate Guarantee', if you find a lower price from any other London based lender, we will beat it by 10%. This is why Car Cash Point won the 'Best Business Award for 'Best Customer Focus' and '9.5 out of 10' on customer reviews from Trust Pilot. To apply for a loan from Car Cash Point Logbook Loans, London, simply complete the on-line application form above for an instant, no obligation, quotation or if you prefer, call Freephone 0333 220 4419 to speak to an experienced member of our sales team. We're happy to help and we can complete and transfer funds for your Logbook Book Loan the same day! Why choose Car Cash Point? With no formal credit check required and bad credit accepted, Car Cash Point will complete and transfer funds on your loan the same day. Unlike our competitors, Car Cash Point Logbook Loans London does not advertise false or misleading APR's, which often bear no reality to the overall cost of the loan. If you have obtained a cheaper written quote from another Logbook Loan Lender in London, Car Cash Point guarantees to beat the price by 10% and still complete the same day. A Car Cash Point we put you in control; you select your loan term typically from 12 - 60 months in order to reach a weekly or monthly repayment amount that you can afford. You can then choose when you wish to settle the loan during the term 100% penalty free and without any charges. Plus, don't be seduced by other Logbook Lenders in London who make false, misleading and often confusing claims regarding early settlement charges as the other Logbook Loan lenders based in London will give you a 'discount on the outstanding interest' for settling early which equates to a settlement penalty. If you are in any doubt, ask other lenders to provide you with a settlement figure for your specific period and compare it to a Car Cash Point settlement figure. We guarantee that we will never be beaten on price. We appreciate you want the flexibility to make additional capital payments when you can afford it, to reduce your loan and your payments so you pay less interest. This is why Car Cash Point are the only London based Logbook Loan lender to allow our customers to make capital overpayment of £100 or more at any time during the loan term and as many times as required. It is worth noting the all other London based Logbook Loan lenders will accept overpayments but never reduced the loan amount or re-calculate the loan interest. 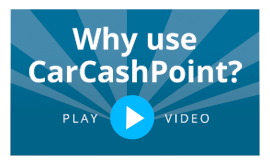 Car Cash Point allow our customers to select either weekly or monthly repayments, always in arrears to match the way wages are paid. This ensures your loan repayments are convenient to maintain and manage. Once your application is received by Car Cash Point, one of our experienced team will contact you to go through your details on the phone to ensure you can afford to repay the loan. They will answer any questions, agree the loan with you and then arrange for one of our specialist representatives out to visit you in the comfort of your home or office. They will check the vehicle and help you complete the paperwork. Once the application is completed, you will receive your cash the same day. Car Cash Point is a fully accredited member of the Consumer Credit Trade Association and therefore is fully compliant with its 'Code of Practice'. We are committed to ethical and responsible lending and to providing the highest levels of professional customer service. See our lending policy. As the nation's capital, London is one of the world's most famous cities. Best known for being the seat of Government, its place on the financial world stage, and numerous tourist landmarks, it's also a multicultural home to over 8m people, and a welcome destination for up to 40m visitors each and every year. With every road, rail link and flight path leading to London, understandably, it's easy to get to wherever you are in the UK - or the world. And London is open for business and pleasure, 24 hours a day, 7 days a week, all year round. With Big Ben, the London Eye, Buckingham Palace and hundreds more sights to see, grabbing a Black cab, jumping on a red bus, or riding the underground can take you there. Thousands of restaurants, bars, and cafés can cater to every taste with food and drinks from around the world. And you can enjoy a day at some of the world's best galleries and museums, followed by a night at a West End theatre. As a leading global city, there's not much London can't offer. And that includes some of the best deals in the capital on logbook loans. And by using Car Cash Point for your logbook loan, you can be guaranteed the lowest rate in London. We'll never be beaten on price, service or quality, and if you find any other logbook loan lender in London with a lower price, our Car Cash Point 'Best Rate' promise means we'll beat it by 10% for you. Car Cash Point loan terms start at 1 year up to a maximum of 3 years – you choose. You can settle your loan at any time penalty free and pay less interest. The maximum APR is 230.70%.